Sheree Burlington hand paints your family name on this earthenware bowl that celebrates closeness. Even as your family branches out across the world, you'll always have those ceremonial gatherings to keep you rooted to each other. Sheree Burlington hand-paints the earthenware with your family name (ten characters total), and the cursive that curls around the edge reads: "Each a branch upon a tree, reaching for the sky, bound by roots that draw us home, even as we fly." Designed to serve a crowd, each bowl is dipped in a food-safe glaze and can serve a bounty of salad, pasta, or fresh fruit. 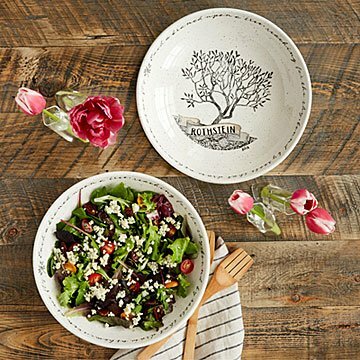 Whether you only bring it out for special occasions, or make it a part of the dinner routine, this functional tribute to family celebrates the connection you share with those at your table. Handmade in Italy. Hand-painted in Manchester, New Hampshire. Bought this for my father. He absolutely loved it!! My Mother-in-law was truly surprised when she opened her gift. It was beautiful. She loved it. The moment I saw this serving bowl online, I knew I had to order it for mom. This serving bowl fits my mom's family dinners perfectly! Thank You!! The perfect gift for the person who has (almost) everything! This gift was perfect! My niece LOVED it! I would use it as a pasta or salad bowl.